Technology should be leveraged to make insurance more affordable in India. As an IT-savvy nation, India should use Technology as an important tool to increase the coverage of uninsured population and hence help in reduction of the insurance policy cost. As the total insured population in India is a very small base, the role of technology to push the product through multiple channels including Internet, Mobile will help increase the coverage. This increased coverage will reduce the cost of insurance and make it more affordable to the common man, Mr. R Raghavan, CEO – IIB, said at the “IIRFA 2016”, the Annual Conclave of Insurance Information and Ratemaking Forum of Asia, at Hyderabad on May 26-27, 2016. Since Insurance is a Push Product and India is not a risk sensitive country, the Insurance companies and Government – Center & State need to collaborate and incentivize the need for taking an insurance cover. The most important insurance required in India is Health Insurance and all players need to work together to increase the coverage in the population as it helps reduce the cost and make it affordable. The farm insurance is another very important insurance cover and role of technology is paramount to both increase the coverage as well reduce the cost, he said at the IIRFA 2016 Conclave. Data is integral to operations of insurance companies and use of sound & stable data – its integrity, authenticity & security besides its reliability play a key role to take considered decisions. Google, the largest search engine & Technology and Service Provider is preparing its back-end to explore an entry the Insurance industry. With the availability of huge data at its disposal on the large population of India and its mapping on all our online activities, Google is considering the entry into the insurance industry by leveraging the data at its disposal. The inaugural address was given by Mr. T S Vijayan, Chairman – IIB & IRDAI and there were many interesting sessions on Rate Making & Insurance Analytics with Mr. Byung Moon Yoo, GM – Training Team, Korea Insurance Development Institute, Mr. Kazunori Onoe, MD – General Insurance Rating Organization of Japan (GIROJ) among two other speakers. The Panel Discussion on the Use of Big Data in Insurance Fraud Management had speakers sharing their experience in Health Insurance, Motor Insurance, Life Insurance, fraud verification and agency fraud in life insurance. Dr. V. Thiruppugazh, IAS, Joint Secretary (Policy & Plan), National Disaster Management Authority, Government of India had a very detailed presentation on disaster management – issues, challenges & opportunities. He spoke about how the country is not a risk-sensitive nation and despite repeated natural & man-made calamities; Indians still are not willing to take insurance cover. Insurance Information Bureau of India (IIB) is hosting the IIRA 2016 Conclave. IIRFA is a pan-Asian body of Insurance analytics and ratemaking bodies and its annual conclave is held in a different member country each year. 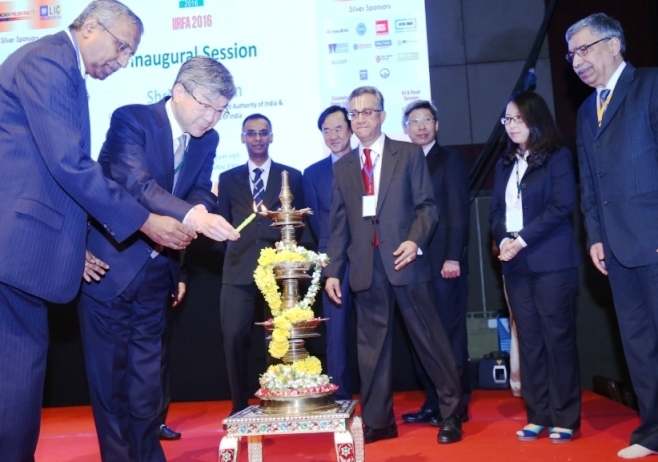 This year, it is being held in India, hosted by IIB. IIRFA 2016 has twin themes of Ratemaking and Insurance Analytics & Financial Inclusion in Insurance. Special sessions on Life Insurance Analytics and Disaster Management and Financing are part of the programme as are Panel discussions on Fraud Control using Big Data Analytics and the integral linkages between micro-finance and micro-insurance. Over 200+ delegates attended the IIRFA 2016 at Hyderabad to share and discuss critical developments in Insurance Analytics and to showcase initiatives in Financial Inclusion in insurance as well as lessons learnt. Established by IRDA in 2010 as a single platform to meet the needs of Indian insurance industry, IIB gathers transactional level data on insurance from both Life and General Insurers performs analytics for the benefit of the Industry, policy makers, Regulator and the public at large. Within a short span of time, IIB has taken significant strides towards making an impact on the insurance industry and the society at large. V-Seva: A repository of Vehicle Insurance policy information. Police, insurers and the-public can check whether a vehicle has a valid insurance policy or not at any point of time using this service. ROHINI: The Unique Hospital Id Initiative, captures all hospitals in India which falls under Health insurance provider network through a unique ID helping reduce fraudulent claims, and making health insurance more affordable in the long run. Property Insurance: Analytics of product pricing in Fire insurance, concentration of exposures, impact of natural catastrophes, etc., enabling insurers to be more prepared for the risks undertaken by them. Health Insurance: Publication of Health Burning Costs. Motor Insurance: Analytics Reports of IIB is treated as a benchmark by the actuaries at general insurance companies for pricing. IRDA has extensively used data from IIB to effect the revisions to the third-party motor insurance premiums. IALM reports, the DNA of life insurance products and their pricing, will now be published under the aegis of IIB. Insurance Information and Ratemaking Forum of Asia (IIRFA) is an organisation voluntarily created by Insurance Analytics organisations of Asian Countries. Currently the membership comprises: Korea Insurance Development Institute (KIDI), Insurance Premium Rating Bureau of Thailand (IPRB), Insurance Services Malaysia Berhad (ISM), Taiwan Insurance Institute (TII), General Insurance Rating Organization of Japan (GIRO), Insurance Association of China (IAC) and Insurance Information Bureau of India (IIB). Indonesia Financial Services Authority (Otoritas Jasa Keuangan – OJK) has expressed desire to enroll as a member.